I've loved doing cloth diapers with the boys. Even though it has been a lot of work. There are conflicting accounts as to the reduction of carbon footprint by use of cloth diapers, but hopefully I've done good things on that end. The initial investment in cloth diapers was daunting, but thanks to the help of several family members it was manageable. And I took comfort knowing that over time, it would be cheaper than disposable diapers. And then the dryer broke, a year after toiling to dry cloth diapers on a mostly daily basis. It was 14 years old, though, purchased shortly after Paul and I married. So we purchased a new dryer. A month or so after that, the sump pump broke, and the basement flooded. The sump pump was only 5 years old. A shady plumber was hired who double billed us, and resulted in a complaint being filed with the Better Business Bureau and a lot of stress on my part. Finally, that was resolved. And Paul purchased a new sump pump and installed it. And I was back in business with my cloth diapers. And then. Last week? The washer stopped spinning. The motor made a noise. You know the type. A noise indicating life was expiring. And so, we purchased the washer to match our fairly new dryer. Now we have a complete set again. And now I know that cloth diapers? Well, not so cost-effective after all. On a brighter note, I now have an energy efficient washer. And I suspect potty training is in the very, very near future. I have a giveaway for THREE $25 gift cards to Maggiano's! Go enter here! Bless your heart! May your new goods have very LONG lives. The new ones are so pretty! I really hope they last for a long time! I agree with Nancy what you saved in $$ and the fact that all those didn't go into the land fill and they are better for your kiddos :O). I also agree with her I applaud and appreciate your green efforts! A little tip for a front-loader washer: Many people complain about an odor that front-loaders develop - to the extent that you can now buy 'front loader cleaner'! My front-loader is several years old and I have never had that problem. How did I avoid it? When the washer is not in use, do not fully close the door. I shut it but not so that it is sealed. If it is sealed, no air can get in and it can never dry completely! I tried the cloth ones and after changing the blankets, clothes and all I gave in to disposable.You are helping reduce waste that may greatly affect your children in the future. I'm impressed at your commitment. Diapers are just a horrible choice to decide from cost to labor to impact. I have always hated spending money on appliances. At least you should be good for a while. With that being said, I know how hard it is with cloth diapers - I definitely applaud anyone who uses them. Why is it when one thing goes wrong... several things go wrong? Our sump pump broke a couple of years ago and we had to buy a new one. We also now have a backup that uses water to force the water out of the sump pump. So far it has worked great when we lose electric. I hope your new washer and dryer treat you well! Oh My Goodness.....I used cloth diapers with my first son ---and non-cloth with the other two... Think I'd chose the non-cloth IF I had to do it all again.. Sorry you have had trouble--but the new washer/dryer is fabulous!!!!! When child number four was born I seriously considered using cloth diapers. But the initial investment was enough to make me decide to stick with disposables. I am glad that I did too! 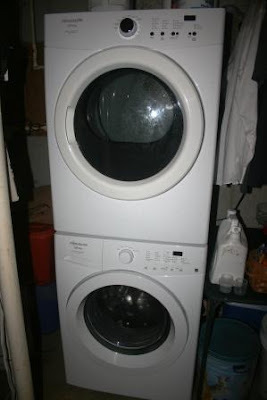 Enjoy your washer and dryer they look awesome! Have a Merry Christmas and Happy New Year! How frustrating - you try to do the right (the green) thing, and have one thing on top of another go wrong! Wow you are one hard working lady! I always wonder how people used to live with cloth diapers...Kudos to you! I thought about cloth, but went with disposables. They say stuff happens in 3s, hopefully you are done for a long time now! I like the new ones- so pretty! I really wished we cloth diapered. I think I am going to put it on my new years resolutions. Now I wonder how you'll like the front load, or did you have that before too? Well they say when it rains, it pours. You've sure had your share of troubles-Wow! I know what you mean. It's very hard to weigh out a proper balance. I love to hang out my clothes, but then if I have to iron most of them, I wonder if I've really saved any energy or not. When I dry them they don't require ironing. Oh, we just have to do the best we can. Good luck with that potty training! Those are so hidden costs for sure. My mom used cloth diapers on me but today with the disposables available I could never do cloth until I was forced too. However my philosophy on reducing carbon foot print is we all have to do what we can in areas we care about most. Good for you! I am so sorry to hear all that. We have had some issues in our rental and luckily John will just fix it himself. So that I don't have to deal with the shady (other) plumber that I don't know. My hubby also was the one that kept telling me not to go for cloth diapers. Who could remember as from being a kid helping his mom with the washing of them. She had 8 kids! He actually told me... You really don't want cloth. The wear on the machines and the time it takes to wash 'm. And what when you are gone for the day? Or when they are sick. The bleaching etc. He named it all. The rubbing scrubbing when your machine does not work. Several of my friends had cloth. And tried to rub it of on me. I admit I declined. I have caused hundreds of diapers on the landfill. With my six kids in diapers throughout the years. I do not feel to guilty though now that I read your story. Thank you for sharing Lisa! Hugs to you and your cubs. I feel a tat bit bad... So I wanted to add... I agree with Cascia! It was such an expense to get started. Also I forgot I did try them for a couple of weeeks. A friend had me borrow some. It was so much work. And then the little one got sick. So I gave up.